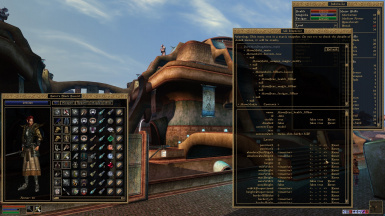 UI viewer and interactive editor for Morrowind UIs. Requires MWSE 2.1 nightly and MGE XE 0.10.0 or later. Press F3 to open/close in-game. MWSE 2.1 Still in development. MWSE version 2.1 is currently in development. The nightly build is available from the mirror here until release, an updater program is included. Allows inspection of the UI menu hierarchy and all layout values. Layout variables can be modified in-game for fine-tuning your own UIs.